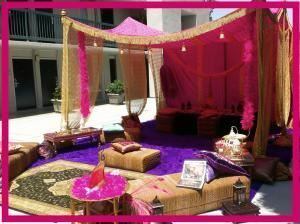 If you're looking for something unique and luxurious for your up coming Bat Mitzvah, Sweet-Sixteen, wedding ceremony or reception look no further than The Lavish Cabana Collection to fulfill your desires. Our custom-made Cabanas are ultra luxurious having been made from fine fabrics, accented with 6 inch gold tassels and when lit up with our accent lighting one would think royalty must be coming by for dinner. And when it comes to dinning you have the option of sitting either Low-table style (a big hit with our weddings), or regular round top seating. These Cabanas may be used for the ceremony itself, a hide-away for the bride and her bridesmaids before the ceremony, to dine underneath for the wedding party and close family (or more), or just to lounge under pre & post reception. Once you see our Lavish Cabana Collection you will realize that this is what will make your special day...breathtaking And our cabanas are a great add-on to whatever you might already have planned. These cabanas are an amazing backdrop in an otherwise plain walled or shrubbed background. Come in and see what we mean.